What a wonderful old fence leadibg down to the water... it really draws me into the shot. Great! What a great old fence...well shot and nice composition. Great leading line and allowing the left edge to blow out... Adds a lot of depth and mystery..
Now this is a neat fence. Great capture! This totally rocks. You aced this. Great shot...wonderful composition. The sepia tones really work well here! Nice perspective and composition. Good choice of tones. Superb eye line through the frame! Love the textures and details on the fence, tremendous shot! Wow! this is a wonderful composition! Nice flow of line in the fence and downward slope. It looks good in monochrome! 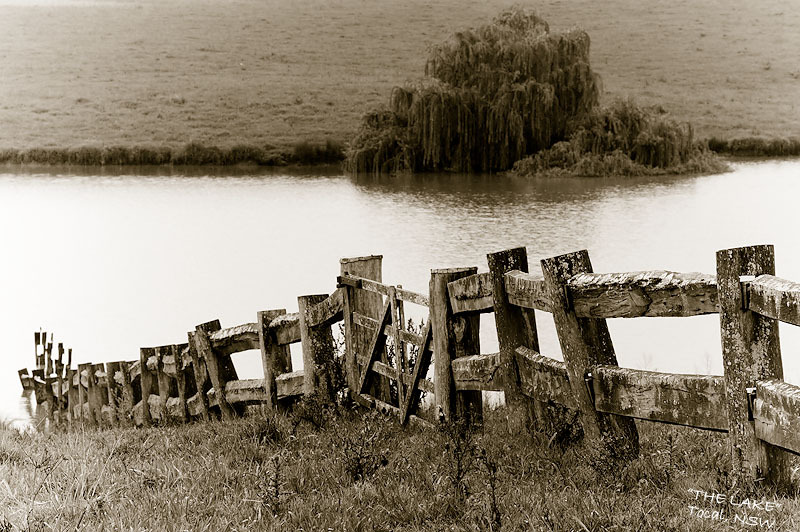 Love the focus on the fence, with that old feel to it, Beautiful composition! This is such a gorgeous shot, Greg. Old fences are one of my favorite sights and you captured this one beautifully. Wonderful old fence, has a bit of history! Like the texture and the diagonal line. Beautiful picture and beautiful sepia tones. The textures in the fence are so vivid, my eye's a bit lost though, following the fence down to the waters edge, then doesn't seem to have any more direction. Very strong composition and beautiful toning.